Pipe Cleaners - $1 pack from a Dollar Store. 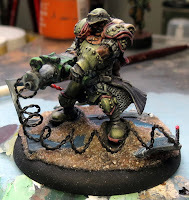 = For $3, you can make an armies worth of barbed wire. 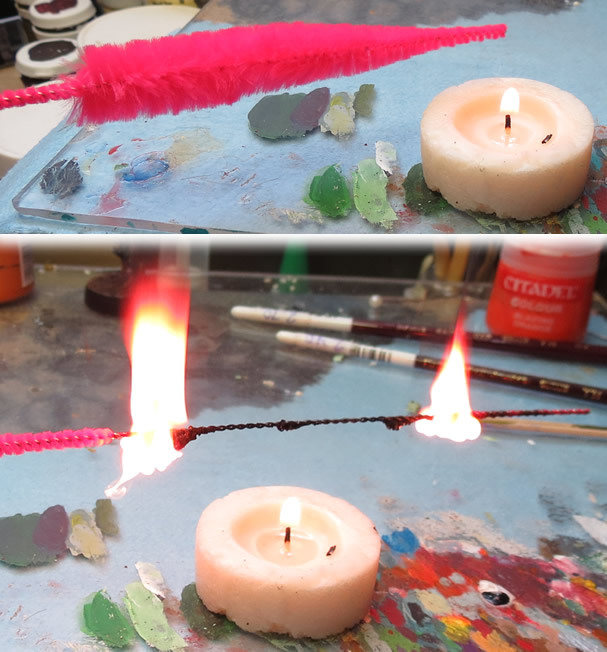 As a first step, I burn away the material from the pipe cleaner. To make it easier and make sure my hands are free to control the fire and wire, I've lit a candle that can stand still. You probably don't want to breathe much of this in so a face mask or well ventilated area may be best. Be careful! Pipe cleaners, especially the fluffier kind, apparently catch fire really easily. You don't want to drop this on your clothes, carpet or anything else flammable. It would be safest to do this work outside over concrete or pavement. Using a pair of pliers would also make for a safer way to hold the wire. All the residue from the pipe cleaner material is going to get messy. 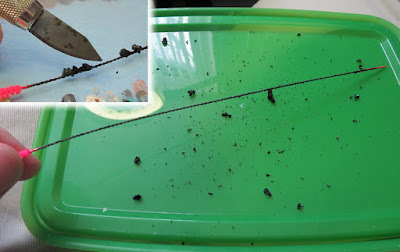 Hold the wire over something easy to clean up and scrape it with a knife. Wrap the wire around a cylindrical object as large as you want the loops. Use one of your paint brushes, a pencil, a pen or something similar. There may not be visible barbs, but at this scale it looks like great barbed wire. 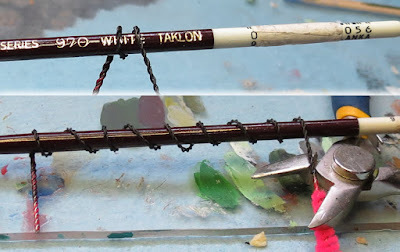 If you wanted to, you could twist on small pieces of extra wire along the length of the barbed wire. This wire's pretty thin so it won't be a problem to cut to the length you need. Super-glue will work to attach it to a base... or even a miniature if you wanted to do something like wrap it around a weapon, fist or armour.